Nineteen students from six universities around the globe have been at McGill for the past two weeks taking RELG 550, an intensive course on human rights and religious minorities hosted in collaboration with the Tony Blair Faith Foundation. 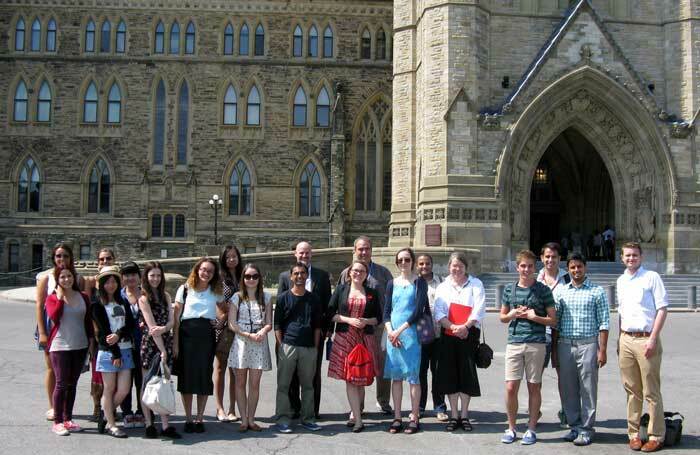 Students and lecturers from RELG 550 visited Parliament in Ottawa during their two-week stay at McGill. Nineteen students from six universities around the globe have been at McGill for the past two weeks taking RELG 550, an intensive course on human rights and religious minorities hosted in collaboration with the Tony Blair Faith Foundation (TBFF). The Foundation aims to promote respect and understanding between the major religions, to make the case for faith as a force for good and to show this in action by encouraging inter-faith initiatives to tackle global poverty and conflict. Its work with universities focuses on research and teaching that critically analyzes the role of the world’s religions within the dynamics of globalization. The course participants are students involved with the Faith and Globalisation Initiative (FGI), a worldwide network of leading research universities that seeks to understand attitudes towards religious faith in a globalized world through research. In December 2009, McGill became the first Canadian university to partner with the TBFF on the Initiative. Today, the FGI network is made up of ten universities from around the world: McGill, Yale, the National University of Singapore, Durham University in England, Tecnológico de Monterrey, the University of Western Australia, the University of Hong Kong, the University of Sierra Leone (Fourah Bay College), the American University in Kosovo (Pristina University), and Peking University. Students taking this summer’s course came from McGill (4), the University of Western Australia (5), the National University of Singapore (3), Peking University in Beijing (3), Mexico’s Monterrey Tech (3), and Yale (1). 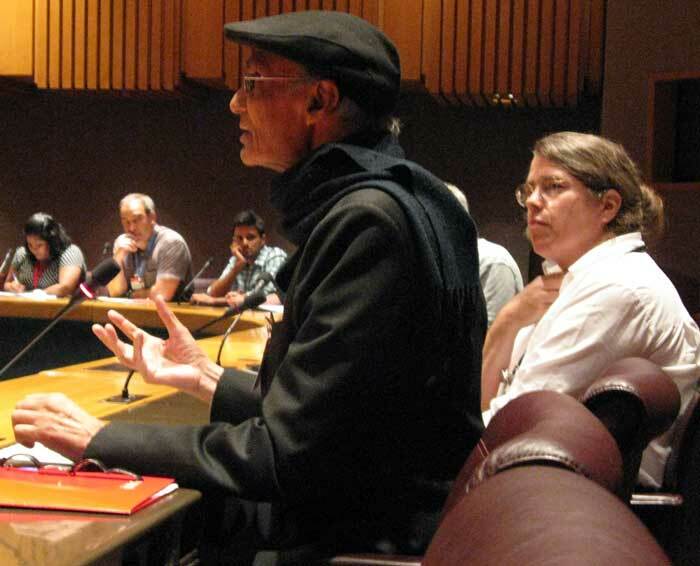 Arvind Sharma, Birks Professor of Comparative Religion in McGill's Faculty of Religious Studies, makes a point during a panel discussion while Dean Ellen Aitken looks on. The course consisted of a series of lectures and panel discussions exploring contemporary issues to the rights of religious minorities. Topics covered included the historical evolution of the international conversation on religious minorities and human rights, the diverse contributions of the major world religions and their approaches to religious minorities, and contemporary legal, philosophical and theological debates on the relationship of religion, rights, and the law in democratic societies. 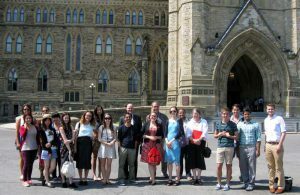 Participants also took part in activities outside the classroom, including a meeting with officials from the Department of Foreign Affairs and International Trade in Ottawa and a tour of the Houses of Parliament, where they had a conversation with Liberal MP John MacKay. “Taking part in this course is a wonderful opportunity to translate wider ideas surrounding religion and human rights into a different approach to indigenous Australia and tackling health and education in rural communities, an area in which I am very passionate about,” said Tessa Brown, who is pursuing a BA in Anthropology at the University of Western Australia. While McGill will continue to develop various dimensions of the initiative in the world’s religions and globalization—teaching, research, publication, public outreach—both in the Faculty of Religious Studies and in partnership with many others across the university, Dean Aitken says, the summer course itself will probably move to one of the other universities in the network next year, in a different part of the world and with a different thematic focus. For more information about the Tony Blair Faith Foundation’s Faith and Globalisation Initiative, visit www.fgi-tbff.org/. For information about the initiative at McGill, visit www.mcgill.ca/religionandglobalization. Special thanks to Kate Leuschen Millar and Aatif Baskanderi for their assistance in the writing of this article.